ASI USES OVERSIZED FAST RECOVERY EXPANSION VALVE SYSTEM FOR QUICK TEMPETURE RECOVERY WHEN DOORS ARE OPENED FREQUENTLY AT PEEK TIMES. FOOD PRODUCTS QUALITY AND SAFETY ARE AFFECTED BY IRREGULAR TEMPERATURE LEVELS. MANY COMPETITORS USE "CAPILIARY SYSTEMS" WHICH HAVE SLOW RECOVERY TIME. 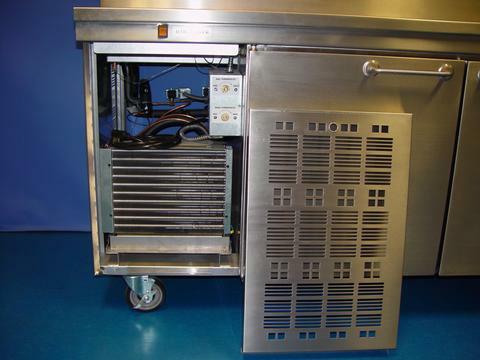 ALL REFRIGERATION UNITS ARE PROVIDED WITH THEMOSTATIC CONTROLS(S) FOR FIELD ADJUSTABILITY: (1) FOR THE BASE CABINET AND (1) FOR THE REFRIGERATION RAIL.